We are a locally owned Australian company, so you can feel happy knowing that the money you spend on your tour with us will be staying here in the local economy. As a family run business, the owners Jan and Claire share skippering the vessel and running the office. They have been in the marine tourism industry for nearly 20 years, so they most certainly know how to look after their guests. 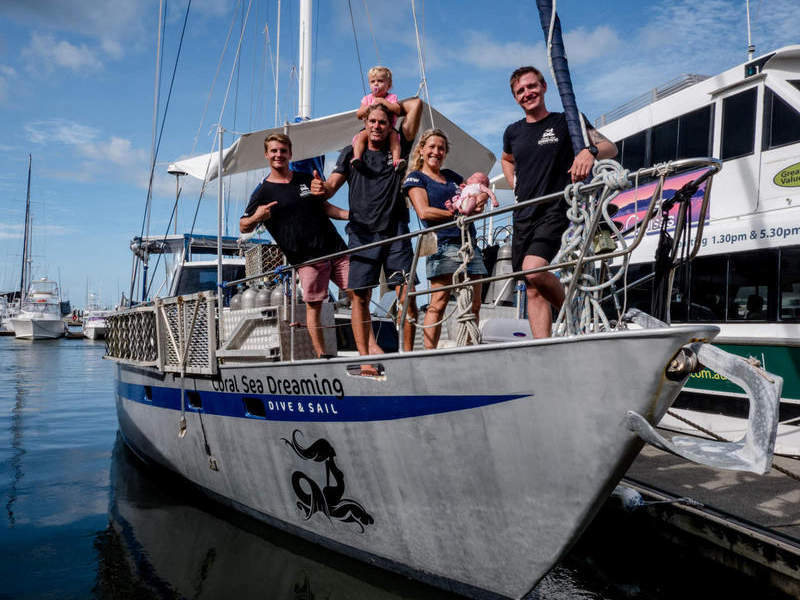 Their two little girls who are quickly growing up as little mermaids also love being on-board the boat and swimming around the Great Barrier Reef. As an owner operator run business we make it our personal business to ensure everything runs ship shape so that all guests enjoy a truly once in a life time experience. We pride ourselves on caring for our customers and providing personalised service. From the very first enquiry through to our friendly reservations team you will feel part of the Coral Sea Dreaming family. Then when onboard you will feel right at home with our amazing and caring dream team who are all highly experienced dive instructors, deck hands and sailors from all over the world. The dream team will keep you happy and safe while you sail the high seas and dive into the Great Barrier Reef.